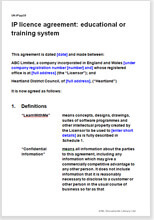 This is a heavyweight licence agreement for a "How to" product; for example an educational or training system, or a system for psychometric testing. Your product is likely to be provided as a CD or DVD, maybe with hard copy or hard product support. The licence is flexible. It assumes a single fee and/or a royalty. It includes many options, for example that the licensee will require a licence to use supporting systems, in common with your other licensees. You may be an individual or represent a company. You have devised and produced an education or training system. It could be anything. It may be applicable in one industry or many. You want to protect your intellectual property in licensing its use to many people. You may grant licenses to individuals, companies or governmental organisations like schools and local authorities. Your product or device or invention relies to some extent on a support system, no matter large or small, which requires slightly different licence terms because it may be used by others. You might upgrade it from time to time. This agreement covers your intellectual property rights in every aspect of your work: design drawings, copyright, software, patents and more. It provides for a single up front payment but you could change this to an annual payment. The licence lasts for as long as you decide. It is limited to a particular market or application or territory, or all of these. There are no re-sale or sub-licence rights. The agreement provides options for support - or none. It is also assumed that the licensee will require a licence to use your support systems, in common with licensees in other industries. You do have continuing control over that licence. It is therefore more limited. First, it may have far wider application and you will wish to use it in the same market for other applications, or in other products and other markets. The second reason is that you may not own all the supporting material. You may yourself use some IP which he has licensed to you from others. The best you can do with that IP is to make sure you are allowed to sub-license it, then do just that. You choose the exact deal you want in this agreement. You are always in control. You can choose “in” or “out” or edit. This agreement provides the complete legal framework for what may appear to be a complicated deal. The Net Lawman modular structure in plain English takes you smoothly through the detail of a document of over 5,000 words.